Kemet is a religion of recent but unclear origin. It is an attempt to reconstruct ancient religious practices of Kemet (Egypt), in as much of a pure form as possible. Kemetic belief is Monolatrous- that is, most believe, like the ancients, that there is only one supreme God, who manifests in many aspects as the minor deities. Most adhere to the "42 Principles of Ma'at" or divine justice, a series of "negative confessions" drawn from the Book of the Dead, which list various sins that must be avoided to successfully enter the afterlife. 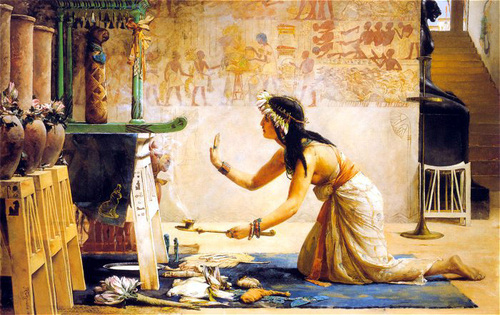 Many Kemetic faith groups use traditionally Egyptian models of initiation and priesthoods, usually conforming with particular God and Goddess cults, which varied by region, and time period. As ancient Egyptian religion actually included a multiplicity of faiths, actual practices can vary widely. I have not transgressed the law. I have never stopped the flow of water.